I've been included in a new book! 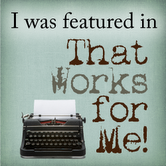 I few months I was asked if one of my "Works for Me Wednesday" tips could be included in the new e-book, "That Works for Me! I was delighted and said sure!! and they included it. You can order it for $8 on the photo above. But the one they included wasn't one that got a lot of hits. These links below are to the most popular WFMW tips I have submitted over the years. Hope you enjoy them!